Summer is crowded with beaches.The waves are calm and young children can enjoy swimming with a relatively safe swimming. You can come and go from the hotel in 1 minute on foot.There is also a walk course. It is held on the first Saturday of April every Sunday. We invited guests who had visited the restaurant to enjoy sweet sake (free) and Mitarashi Dango (guest free).Night light up during the flowering period (from 18:00 to 21:00) is also conducted. Just beside the hotel, a memorial poem that Man'yo Poet named after this land in a 500-meter promenade leading to Inamura Shrine is lined with flowers such as Murasakusibu · Shirahagi, which is said to be "Man'yo Flower", is a beautiful small diameter. The "Ajisai (hydrangea) Festival" will be held every year when 50,000 varieties of hydrangea, which are being planted in "Katahara Onsen Ajisai no Sato", bloom in June each year. 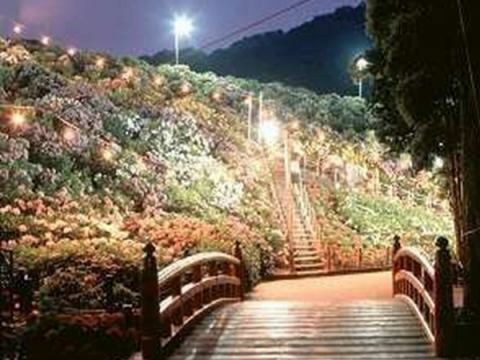 There is evening light up and various entertainment during the period.Fireflies are also emitted in the back stream of the river, which makes the romantic space even more exciting. 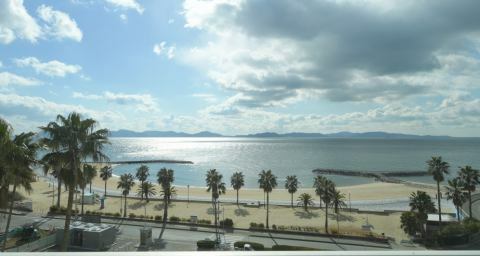 It is the only general marine resort in the prefecture that wants nice rich Mikawa Bay. Entertainment, gourmet & shopping, thalassotherapy to hot springs, it is an extremely popular spot where you can enjoy all kinds of leisure style. Built Heian Time Period (780 - 1180), it is a famous temple for cancer seal.Cancer prayers can be accepted every day, and you can hear the unique anti cancer prevention legs by occupation.Worshipers visit from all over Japan, you can also Sembutsu Cave Tour that modeled Chinese Sekkutsu Jiin in the back of the main road. Specialty Kaizen Menu are on request. 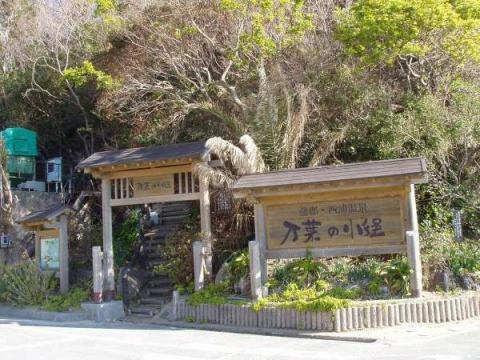 The symbol "Takeshima" of Gamagori that is tied to the land with a bridge of 387 meters in length.The small island of 620 meters in the circumference and a total area of ​​19,000 square meters, the autonomy of 238 kinds of higher plants in 65 families has been confirmed, and the aspect covered with the elephant broad-leaved trees unique to the warm temperate forest is a landscape with the pine wood forest on the opposite side It is different.There are no such examples in the Tokai Region, the entire island is designated as a natural monument of the country. In the central part of the island is one of the Japan Seven Benzaiten -Renten, and there is "Yaotomi Shrine" which is also known as god of fortune-telling, relief and marriage.There is a promenade that can be reached around 30 minutes around the island, and you can enjoy the views of both the sea and the island. 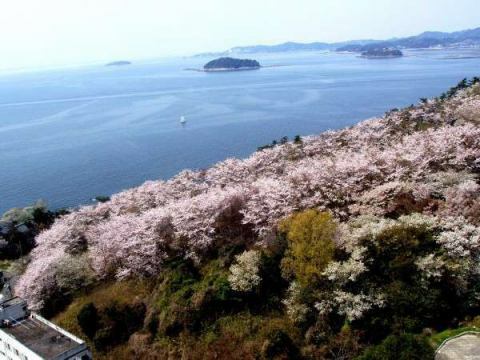 From early April to late June you can also enjoy a tidal harbor on the Takeshima Beach. About 500 kinds of creatures are constantly exhibited and about 4,500 living creatures are exhibited. The number of exhibits of deep-sea creatures is the nation's most proud. It is popular with a powerful full-hearted sea lion show, capybara show, and "touching pool" that can actually touch living things. Exhibit organisms are displaying both sea water and freshwater (rivers and lakes, etc.). Exhibits are constantly changing, and exhibited organisms change every day from day to day. It is a homely aquarium where you can relax and see the living things in a relaxed atmosphere in the facility. It is an exhibition facility that allows you to experience the 4.6 billion years of "earth, ocean, life" in a clear and easy-to-understand manner with meteorite, fossil specimens and computer graphics.In the exhibition room you can touch the fossils and rocks of various eras, and you can experience the ancient ocean while enjoying the "journey to the sea of ​​life" with the game feeling with the large screen of 200 inch at the museum theater. You can experience various kinds of seasonal fruit hunting including "Mikan" special product of Gamagori-shi. 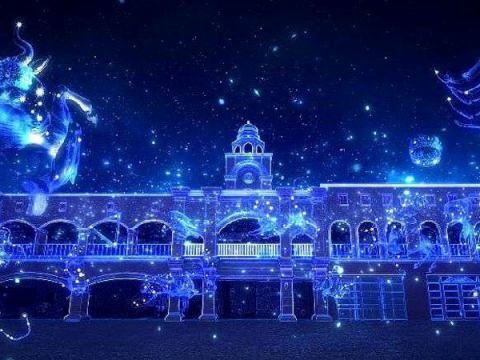 It is an exhibition facility that expresses the mysterious world with about 50 million shellfish collected from 110 countries around the world.You can enjoy splendid shellfish such as coral reefs, dragons and Ryugin castle using 5 million shells.You can also see ancient fossils and odd stones.